We’ve been going through a lot of yogurt lately, mostly for breakfasts and baking, and a day or two ago when I used up all but the last half-cup or so on a batch of muffins, I decided it was high time to start making my own. I’d come across some instructions for making yogurt in a crockpot some time ago, and I thought it looked like a promising method, particularly since I don’t have an electric heating pad or a gas oven with a pilot light. I followed this recipe pretty exactly, using a quart each of 1% and whole milk. (Our skinny boy still drinks a ton of whole milk, so I feel somewhat guilty stealing it for baking, homemade ricotta, and now yogurt.) Yogurt can be made from any milk—from raw and whole to ultra-pasteurized and skim, from cow to goat to water buffalo, even coconut and soy—but keep in mind that like fresh ricotta cheese, your yogurt will taste like the milk you use, so higher quality is always better. The basic principle is getting the milk to the right temperature for incubating the yogurt culture—too cold and it won’t develop, too hot and you’ll kill it—and the crockpot largely acts like an insulator rather than a heat source. Once the milk was heated, cooled, and mixed with my remaining store-bought yogurt, I wrapped the crockpot in two old towels and set it in the oven for further insulation overnight (it had been turned on earlier in the day to cook a roast beef, but was off for at least 3-4 hours before the yogurt went in). The ambient temperature in my kitchen probably hovered around 72F overnight. After 12 hours of culturing, I removed the crockpot, unwound the towels, and anxiously dipped a spoon into the finished product. Sure enough, I had yogurt! It is not much thicker than storebought buttermilk, but definitely thicker than the milk I started with and has that sour yogurt tang, just like the sort we’ve been buying. It also has a sort of odd viscosity to it, sheeting off the spoon in long strands; this may be what the original poster described as a “springiness” caused by cooking the yogurt in a 4.5-quart crock. Why the size of the crockpot should make a difference in texture, I’m not sure, but I’ll try heating my milk a bit longer next time as she suggested, and make note of the temperature along the way. I ladled about half of my finished yogurt into a large colander well lined with paper towels, in order to drain it for a slightly tighter texture. After 3 hours, about 2 cups of whey had drained off, and the yogurt was marginally thicker; I wasn’t interested in making yogurt cheese at the time, so I decided to call it good and transferred it to a container for storage. 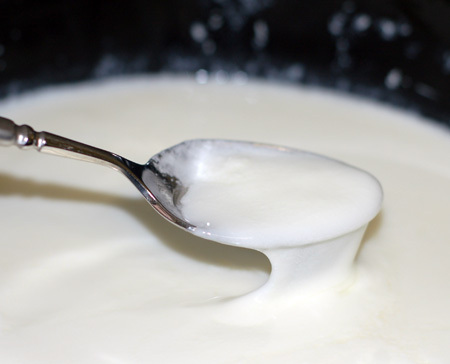 Other alternatives for thickening homemade yogurt include adding some gelatin (avoid this if you do want to make yogurt cheese later) or powdered milk when you stir in the starter yogurt. The finished yogurt should keep for about 7-10 days. Just make sure you reserve half a cup to start the next batch; you can also freeze portions for this purpose if you won’t be making more right away. Turn your crock pot to low and pour in 1/2 gallon of milk (any percentage of milkfat). Heat on low for 2 hours and 30 minutes for a 2 quart crock, 2 hours and 45 minutes for a 4-4.5 quart crock; shoot for 180F. Once the time has elapsed, turn your crock pot off and unplug it. Let the milk cool in the crock with the lid on for 3 hours, until it is lukewarm to the touch, about 110F. Remove 1-2 cups of the warmed milk and place in a bowl. To that, add 1/2 cup of yogurt with live active cultures and mix very well. Pour the yogurt-milk mixture back into the milk and whisk thoroughly. Place the cover back on the crock and wrap the entire crock pot in a thick bath towel or two. You can place the wrapped crock inside your (cool) oven for further insulation (I may actually try setting mine to “proof,” which maintains a temp of around 80F and would help with the culturing when my house is cold). 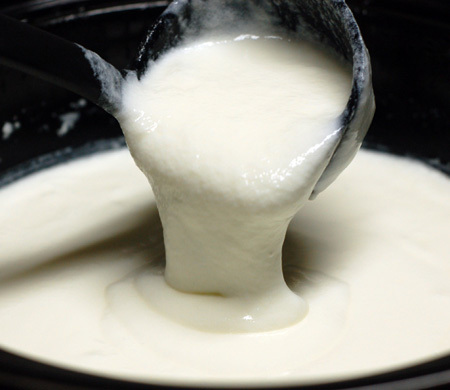 The best temperature for culturing yogurt is approximately 100F. Let it culture overnight, 8-12 hours. In the morning, stir and drain yogurt (if desired) in a lined colander, then store in glass quart jars or a container of your choice. For optimum texture, refrigerate for at least 8 hours before using. Update 7/12/10: I made a fresh batch of yogurt last night, with the following adjustments: I let the milk heat for about 2 hours 45 minutes, until it reached a temperature of about 175F, then cooled it for 3 hours, to the temperature of 120F. 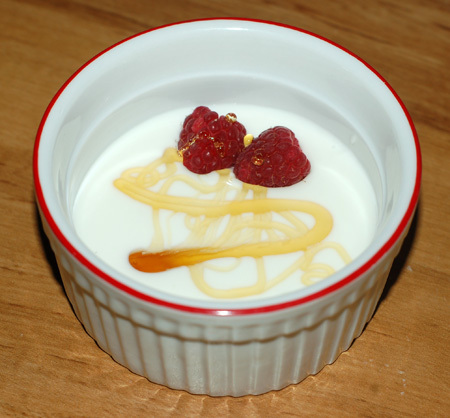 When stirring in the yogurt culture, I also added 1/2 C nonfat powdered milk for body. I wrapped it fully in towels and let it stay in the oven overnight, turning on the “proof” setting before bed. This morning the yogurt I ended up with was noticeably thicker than the first batch, and not as springy or viscous—much more like purchased yogurt. Update 8/15/11: I now make all my yogurt with raw, organic, grass-fed, non-homogenized milk and my new Excalibur dehydrator. The process actually goes much more quickly than the crockpot method, for several reasons. Primarily, raw milk should never be heated over 120F, at which point the beneficial enzymes and essential nutrients begin to break down and you might as well be using pasteurized milk; before I got the dehydrator, I just gently warmed the milk on the stovetop over medium heat for about 10 minutes before pouring it into the warmed (then unplugged) crockpot. Now I just mix together the cold milk and yogurt in a big bowl, cover it, and stick it in the dehydrator set at 115F—12 hours later, thick cream-top yogurt! You will want to refresh your preferred seed culture every few batches, as the bacteria that are naturally present in raw milk will eventually take over your yogurt’s flavor. I typically seek out plain full-fat yogurt with no additives like pectin, preferably organic, with as many different strains of bacteria as possible, which means most Greek-style yogurts are out for me. I have had good luck lately with Brown Cow, Stonyfield, and Mountain High. I do strain most of whey out of my yogurt using a colander lined with a flour-sack towel and set over a large bowl—the whey is incredibly useful for baking and fermenting.